The recalled necklaces contain high levels of lead. This recall involves about 67,000 sets of two necklaces that have a silver-colored metal bead-type chain and a lobster-claw clasp. One of the necklaces has a single, metal pendant with the word "Best" attached to a black metal "yin" pendant. 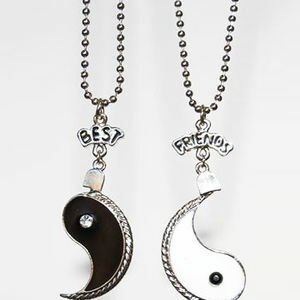 The other necklace has the word "Friends" attached to a white metal "yang" pendant. Claire's stores nationwide from April 2007 through August 2008 for about $8. Immediately take these recalled necklaces away from children and return them to any Claire's store for a full refund. For additional information, call Claire's at (866) 859-9281 between 9 a.m. and 5 p.m. ET Monday through Friday or visit their Web site at www.claires.com.